A struggle ensued, during which time the victim was able to partially remove the mask from the suspect’s face. In doing so, she immediately recognized the man as Joe M. Sotello, a longtime family friend. She also noticed what appeared to be a handgun tucked in Mr. Sotello’s waistband. The victim grabbed a baseball bat from behind the door and fought back in clearly justifiable self-defense. Two teenage witnesses (both 18 year old white female adults) were in the residence at the time and joined in clearly justifiable third-party defense of the victim. Together, the three women physically drove Mr. Sotello out of the house and onto the front lawn. The woman who had been holding the flyer (later determined to be Mr. Sotello’s girlfriend) fled to a silver Honda. Mr. Sotello attempted to get into the car with her; however, he could not escape the three women who continued to get the better of him. His girlfriend fled the scene in the vehicle, while Mr. Sotello was eventually able to escape and flee on foot. While still on scene, officers received new information that Mr. Sotello had surfaced at the residence of one of the victim’s relatives, located in the 200 block of Archdale Drive. Another fight had erupted there, with the relative ultimately detaining Mr. Sotello until police arrival. 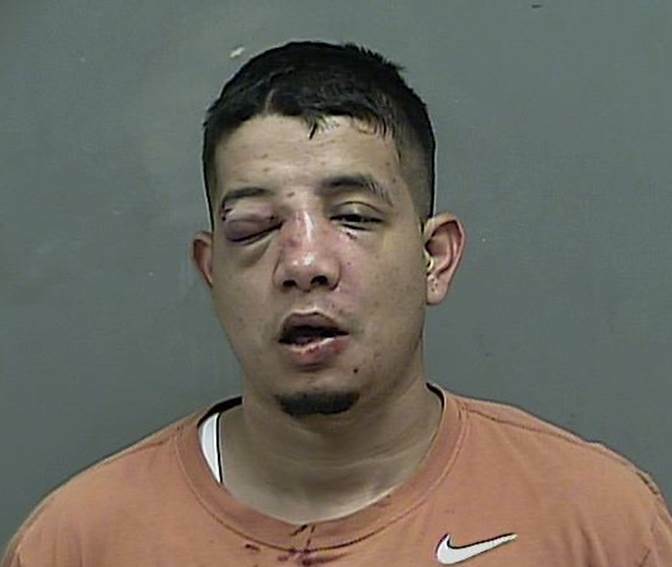 After initially declining medical treatment, Mr. Sotello was arrested for 1) Aggravated Robbery and 2) Aggravated Burglary and transported to the Kingsport City Jail. Due to injuries inflicted upon him during the commission of his crime, and out of an abundance of caution, he was later taken to a local hospital for medical clearance before being incarcerated back in the Kingsport City Jail. After giving several false statements regarding the incident and his whereabouts, Mr. Sotello eventually confessed to his crime, stating that he “had been going through some hard times.” His girlfriend came to the Justice Center on her own volition and confessed that her limited involvement in this incident had been done out of fear of Mr. Sotello and that she had no idea what he actually had planned to do. At this time she has not been charged. Mr. Sotello has since been transferred to the Sullivan County Jail in Blountville where he remains confined, pending arraignment, in lieu of a $35,000 bond as specified by the presiding magistrate. As an interesting side note, the victim was, at only 4 feet 11 inches tall, one entire foot shorter than her attacker and weighed nearly 100 pounds less than her him. At 52 years old, she was also 18 years older than him. Yet, despite being at a clear physical disadvantage, she successfully defended herself and her home from Mr. Sotello’s unprovoked attack. I suspect the sale of baseball bats will increase! Anyone that tries to rob or break into another’s dwelling, is one of the lowest forms of life on God’s green earth in my opinion. The intruder was very fortunate that he broke into her home and not mine. I don’t own a ball bat and I am not able to swing it, but what I do own I can use and he was very lucky.